ALavandhAr says to emperumAn “Since I am not stopping with this Athma samarpaNam which is an act of stealing the AthmA, as you revealed this SEshathvam (servitude of mine towards you) out of your unconditional grace, please bestow me the three levels of para bhakthi out of your grace so that this knowledge is used in the goal (service to you)”. Three levels of para bhakthi are explained in three SlOkams in SrI bhagavath gIthA viz 8.22 “purushas sa para: pArtha bhakthyA labhyasthvananyayA“, 11.54 “bhakthyA thvananyayA Sakya:” and 18.54 “madhbhakthim labhathE param“. bhagavan – Oh my lord! mE prayachcha – kindly bestow me. Oh my lord! as you instructed this servitude in me by your unconditional grace, kindly bestow me the sweetness of devotion [towards you] as well, which is found in nothing else. mayi nithyAm bhavadhIyathAm avabOdhithavAn imAm – The eternal servitude in me towards you. By saying “bhavadhIyathA“, servitude towards others is differentiated. By saying “mayi nithyAm“, it is indicated that the servitude towards bhagavAn in the self is eternal. vishNu thathvam “svathvam Athmani sanjAtham svAmithvam brahmaNi sthitham” (The nature of the jIvAthmA is being the “belonging/possession”; the nature of brahmam/bhagavAn is being “owner/possessor”). By saying “imAm“, ALavandhAr celebrates the sweetness of servitude. yathA avabOdhithavAn – I was instructed the true nature. svayam krupayA – By his exclusive grace. 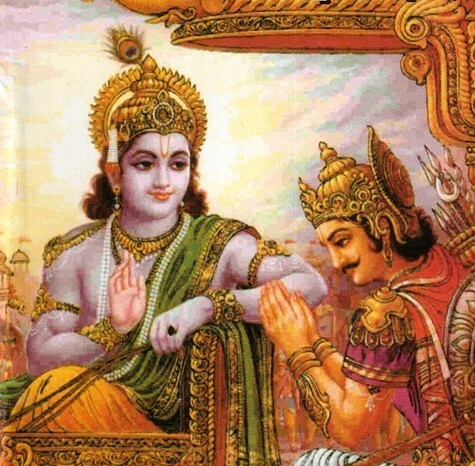 svayam – kEvalam – only. Ethath ananya bhOgyathAm – bhakthi which has sweetness, which does not allow the heart to accept anything else. bhagavan – emperumAn who is complete in gyAnam, Sakthi etc, which makes him give anything to anyone without any hurdle. bhakthim api prayachcha – As you gave the gyAnam (knowledge), in the same manner, please give bhakthi (devotion) as well. mE – for me who is agya (ignorant), aSkatha (incapable) and only has ruchi (taste) [for such devotion]. This entry was posted in Other, sthOthra rathnam on February 23, 2017 by Sarathy Thothathri.